Conducting the Orchestra Society of Philadelphia. In concert at World Cafe Live in Philadelphia. Composition Masterclass for composers at the Wintergreen Festival in Virginia. Stage directing "A Woman in Morocco" for Kentucky Opera. Leading a vocal masterclass for opera singers as part of the Russian Opera Workshop at the Academy of Vocal Arts in Philadelphia. Appearing in concert as a collaborative pianist with soprano Gilda Lyons at the Hudson Opera House. Speaking on National Public Radio about music from the Studio Foundation in New York City. 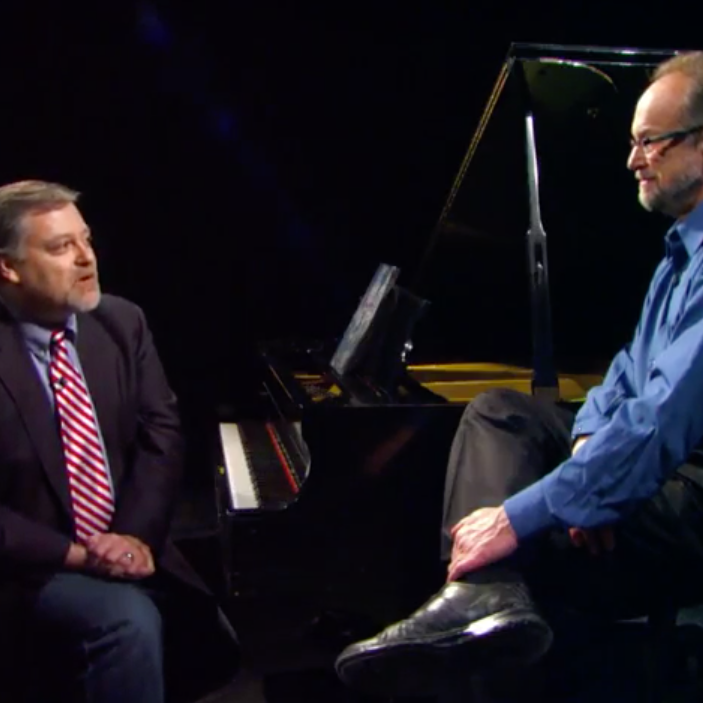 An interview for "Arts Digest," on Milwaukee Public Television. Serving on the Copland House jury at ASCAP in New York City. Producing a recording of Hagen art songs with Lyric Fest at the Morningstar Studios in Philadelphia. Teaching operatic staging and dramaturgy in the Princeton Atelier at the McCarter Theater. Leading an analysis seminar for composers at the Seasons Music Festival and Academy in Yakima, Washington. Serving as artistic director of the Seasons Festival. Conducting a recording session of a new work by pupil Colin Minigan with the Orchestra Society of Philadelphia. ...actively searching for someone at whom to wag my finger. Daron Hagen (b. 1961, Milwaukee, WI) writes music, libretti, and essays, records and performs as pianist and conductor, stage directs, and has run foundations and music festivals. He has worked with orchestras, opera companies, and musicians at every level -- from the New York Philharmonic and Seattle Opera to the Youth Orchestra of San Antonio and high school choruses. His catalogue of over 300 compositions includes works in every genre. His work has received an American Academy of Arts and Letters Academy Award, the Guggenheim Fellowship, the Kennedy Center Frieheim Prize, and two Rockefeller Foundation Bellagio Fellowships. He currently lives in Upstate New York with his wife and two young sons. Hagen has written works of an extremely wide stylistic scope for an array of established and emerging conductors, soloists, ensembles, and organizations including conductors Leonard Bernstein, Leon Botstein, Catherine Comet, David Curtis, Lorenzo Della Fonte, John DeMain, JoAnn Falletta, Frederick Fennell, Guillermo Figueroa, Lukas Foss, Robert Frankenberry, Erin Freeman, Michael Haithcock, Laura Jackson, Jerry Junkin, Kelly Kuo, Tom Leslie, Benjamin Loeb, Zdenek Macal, Mark Mandarano, Joey Mechavich, Brett Mitchell, Michael Morgan, Steven Osgood, Troy Peters, Alexander Platt, Leonard Slatkin, Kenneth Schermerhorn, James Smith, Lawrence Leighton Smith, William Smith, Robert Spano, Niklaus Wyss, and Roger Zahab; pianists Bruce Brubaker, Joel Fan, Gary Graffman, Peter Martin, Marc Peloquin, and Brian Zeger; mezzo-soprano Kate Lindsey, tenors William Burden, Paul Sperry, and Robert White, baritones Nathan Gunn and Robert Orth; violinists Jaime Laredo, Michael Ludwig, and Livia Sohn; cellists Luis Garcia Renart, Sharon Robinson and Sara Sant’Ambrogio; koto virtuosi Yoko Reikano Kimura and Yumi Kurosawa; musicians Jeffrey Khaner, Thomas Piercy, Leonard Raver, and Sören Hermannsson; the Kings Singers, Sundance Institute for Television and Film, Aspen Contemporary Ensemble, Present Music; the Amernet, Borromeo, Elements, Kairos, Lark, Sweet Plantain, and Voxare String Quartets; the Amelia, Finisterra, Lehner, and Prometheus Piano Trios; Seattle Opera, New York Philharmonic, Philadelphia Orchestra, Orpheus Chamber Orchestra, American Composers Orchestra, Seattle Symphony, the Buffalo Philharmonic, the symphony orchestras of Milwaukee, St. Louis, Dayton, Oakland, Long Beach, Denver, Houston, Nashville, Knoxville, Florida Symphony, and the New Mexico Symphony, the Orchestra of the Swan (UK), Opera Theater of Ireland, as well as the Metropolitan Museum of Art, Louvre, Ullens Center for Contemporary Art (Beijing), and Royal Albert Hall. . He has conducted recordings of his operas (Bandanna), served as artistic director (Seasons Music Festival), and is currently chair of composition studies (Wintergreen Summer Music Academy) for music festivals, and served on academic faculties (Bard College, the Curtis Institute, Princeton Atelier). He appears regularly as a collaborative pianist with composer / vocalist Gilda Lyons. The duo has created a series of concerts called "Pairings" in which arias, popular songs, and music theater numbers are rearranged and combined in new ways to highlight their commonalities and themes. He made his debut as a stage director with Kentucky Opera and has directed productions at Symphony Space in New York City, the Actors Theatre of Louisville, and the McCarter Theater in Princeton (New York Stories, The Antient Concert, A Woman in Morocco). A prolific writer, he contributes regularly to the Huffington Post and other online media, has co-written several of the libretti to his operas (New York Stories, A Woman in Morocco), and is writing the libretto for 9/10, an opera for six singers and pre-recorded sound. Hagen joined the Artist Faculty of the Chicago College of the Performing Arts in 2017, which has given him a forum in which to develop his new works in collaboration with students and faculty drawn from the conservatory and Roosevelt University's many disciplines. He has served as president of the Lotte Lehmann Foundation, as a board member (CRI, Joy in Singing), as a trustee (Douglas Moore Fund for American Opera), as composer in residence (Long Beach Symphony, CA), artist in residence (University of Pittsburgh, UNLV, Roosevelt University, Baylor University, Miami University), and is one of two Lifetime Members of the Corporation of Yaddo. Formerly a Composer Mentor for American Opera Projects, he is currently a Distinguished Mentor for Composers Now and founding artistic director of the New Mercury Collective. Hagen’s compositions are widely recorded on various labels, including Shining Brow, 21st Century Song Cycles, and Complete Piano Trios (Naxos), Anniversary in Memoriam (For Lenny) (Sony Classical), Double Concerto (Bridge), Bandanna, Qualities of Light (Albany), Vera of Las Vegas (CRI / New World), Silent Night, Songs, Night Again, Songs of Madness & Sorrow (Arsis), Violin Concerto (Belle Fleur), Koto Concerto (MSR), Wedding Dances (Klavier). A recipient of a 2014 American Academy of Arts and Letters award that recognizes "outstanding artistic achievement and acknowledges the composer who has arrived at his or her own voice," in 2012, he was awarded the Guggenheim Fellowship. His work has also received the Kennedy Center Friedheim Prize, the Camargo Residency, two Rockefeller Foundation Bellagio Fellowships, the Barlow Endowment Prize and Commission, the ASCAP-Nissim Prize, Columbia University's Bearns Prize, the Tanglewood Gelin Fellowship, the ASCAP Samuel Barber and Irving Berlin Fellowships, ASCAP and BMI Young Composer prizes, and the Seattle Opera Chairman's Award. Read a very short bio here and view a chronological timeline here.